Last week a new paper was published describing the effects of the modern golf swing on the lumbar spine. The effects are not good. The article states that professional golfers generate “about 7500 N compressive on the spine during the downswing.” One N (newton) is the amount of force needed to move one kilogram at an acceleration of one meter per second per second. No one’s back is designed to stand up to 7500 of those. Then the article takes on the X-factor, without mentioning Jim McLean. But I will. The greater the angle between the hip line and the shoulder line at the end of the backswing, the more power can be generated on the downswing. However, this position sets up the golfer to deliver a huge load of lateral bending and torsional axial moments (twisting of the spine) right before impact. More distance = more back damage. Thanks, Jim. Exercising the core muscles, and muscles in the back that support the spine, which golfers are told to do, do not help matters. Stronger muscles create stronger swings, which place more force on the spine, not less. If you read the article, which you should absolutely do, there are some technical terms in it. This little glossary should help with a few of them. acromion – a bony process (portrusion) on the shoulder blade that hooks over the front to make a joint with the collar bone. facet joint – joints that allow vertebrae to slide over each other when the back goes through various movements. spinal erector muscles – a set of long muscles that surround the spine and govern certain movements of the back. When these muscles are engaged they exert longitudinal compression on the spine which raises intradiscal pressure. disc annulus – the outer portion of the pulpy mass between the bony vertebral bodies. So. What does this mean for you? First of all, study Justin Thomas’s swing carefully. then do not do what he does. He is a case study of the scary swing identified in this article. Second, remember that the pros need all the distance they can get to be competitive. You don’t if you play from the appropriate tees. Again, though the X-factor that Jim McLean identified might well be true in terms of hitting the ball farther, it is murder on a golfer’s back. Don’t go there. Don’t force your backswing. Get your distance from hitting the ball on the center of the clubface. Fourth, do the things I mentioned in this post about building a back-friendly golf swing. A few years ago I wrote a post showing five exercises designed to strengthen the core in order to play better and prevent injury. Flexibility is a big part of an efficient and healthy golf swing, too. Here are five exercises that will keep you limber for golf. 1. Lateral bend — Stand with your feet apart. Bend to the side as shown, supporting yourself with a hand on the leg. Reach over your head with the other arm to complete the stretch. 2. Supine trunk rotation — Lie down on your back and bring your knees up, feet flat on the ground. Rotate your knees to one side, keeping your shoulders in contact with the ground. This the preferred way to rotate the trunk. Rotating the trunk while standing adds compression force to the torque. When you lie down, there is no compression, only torque. A different way to do this stretch is to start lying on your side with your knees bent, untwisted, with your arms straight in front of you on the ground. Slowly move your top arm away from your other arm toward the floor on the other side as you rotate your trunk, to arrive in the position shown. 3. Rotator cuff — (1) Bring one arm across your body at shoulder level. Use the other forearm to press inward and complete the stretch. (2) Stand in a doorway with both hands on the doorway as shown. Lean forward for the stretch. 4. Hamstring stretch — Sit on the floor with one leg straight out in front of you. If you can’t tuck your other leg as shown, that’s all right. Lean forward (not down) to complete the stretch. 5. 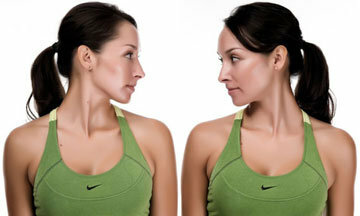 Neck stretch — Rotate the head to the left and hold for a few seconds. Do the same to the right side. You can do all these stretches daily in less than five minutes. I was browsing through my hard drive a few days ago when I found an article about spine loads during a golf swing. Since I have a delicate lower back, I thought I would read this article again to see if had missed anything when I read it the first time some years ago. Indeed, I had. While loads on the lumbar (lower) spine are considerable during the swing, especially in the late downswing, they are not damaging. The caveat is that the discs between the vertebra are viscoelastic and time-rate dependent. What they’re telling us not to do is hit one ball after the other like there’s a race going on. Maybe your back doesn’t feel sore after you do that, but you are putting undue stress on it in any event and not letting it recover. It you do hit balls rapid fire and you do feel your back getting a little sore, that’s a big warning sign. All of us should hit balls slowly. Rest between each shot. Take some time to review in your mind why the ball you just hit did what it did, and what you want to do with your next swing. Or take a few easy partial swings to rehearse a move you’re working on. Then hit another ball. At the range, when it is possible to take a swing every fifteen seconds, instead of every five minutes, like out on the course, slow down. It can only help to keep your lower back healthy while playing a sport that challenges it. I’m not going to beat around the bush. 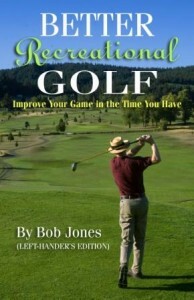 The human body, especially the lower spine, was not designed to withstand the stresses the golf swing places on it. 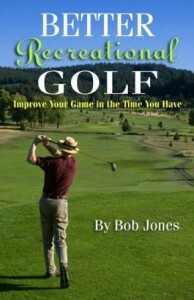 As a recreational golfer, there is no sense in letting your pastime harm your health. 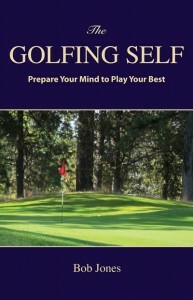 Stress on the back in golf is caused by leaning forward, twisting, and bending to the side. There is also compression, which is the weight of your upper body bearing down vertically on your spine. You can’t eliminate these stresses, but, except for compression, you can minimize them. Here are a few ways to do that. NOTE: If you have low back pain right now when you play, something is wrong. Please see a doctor to find out what that is. Continuing to play golf could be making a problem worse. 1. Slow down your swing, including the part where you swing through the ball. All the forces being applied to your back multiply when you swing through the ball, and they the faster you swing, the more force they load onto your lower back. 2. Stand a little closer to the ball. Not a lot, just a few inches. This will put you in a more upright posture and reduce the unsupported mechanical stress that leaning forward places on your lower back. The lie angles of your irons might need to be adjusted, depending on how much closer you set up. 3. Turn your right foot out. To get more hip turn, turn your right foot out 10 degrees or so. Not too much, because you will create problems for yourself on the throughswing. But do not leave that foot square, like Ben Hogan wanted you too. 4. Take a narrower stance. This frees up the hips to turn more, reducing the amount you twist your spine. This point also helps minimize lateral bending, since your right side is now closer to the ball. 5.Play the ball in the center of your stance when it is on the ground. If the ball is too far forward, you will need to put more lateral bend in your back to go get it. 6. Take a shorter backswing. Use the backswing you would use for an 80-yard pitch. This will prevent you from twisting your spine too much, too. Jim McLean wants you to have a big X-factor so you can hit the ball a long way. Your back does not like a big X-factor. 7. Let the left heel float. If it comes off the ground, fine. If it stays there, fine. Just don’t glue it to the ground. Let it do what it wants to do. 8. Let the right leg straighten on the backswing. I know, everybody these days wants you keep the angle in it you had at address. Allowing the right leg to straightening lets you turn your right hip back more, reducing your X-factor. This will not hurt your ball-striking once you get used to it. 9. Keep your weight balanced through impact. Let your weight go left after you have hit the ball, but not before. Putting the weight left early creates excess lateral bending, because while the lower body is going left , the upper body has to stay back where it was until you have hit the ball. There will always be some lateral bending at impact. Just don’t overdo it. 10. Swing the club with your hands, both hands equally. Swing like you one have one clump of hands on the club, not two separate ones. This not only a better way to swing, for technical reasons, but it will prevent you from trying to hit with your right hand, which can induce lateral bending. 11. Finish upright. Your torso should be straight up and down at the finish, not learning toward the right. A line running down the front of your torso and left leg should be straight — no bending your torso backward, or bowing your left leg. This post has nothing to do with golf. Let’s call it a Public Service Message from TRG. I am tangentially connected with the health industry. What I heard last week makes perfect sense and I want to pass it on to you. A raft of modern health problems have their origin in sitting too much. Sitting at the computer, in front of the tube, anything that lures you into sitting for hours a day. The solution in one word. Move. Get up and move. Get up often and move. Be active. Move. Throughout the day, every day. Thank you. Now back to golf. I am quite fair-skinned. I stay covered from head to toe on the course. Big hat, long sleeves, long pants. Only my hands are exposed, but they have sunscreen on them, and one hand is generally in my pocket as I walk down the fairway. I wonder about the rest of you. The sun is hard on you, and even though you’re not getting burned, damage is getting done. Have you taken a close look at Tom Kite recently? The skin on his face and neck is blotchy from the exposure over the years. Have you ever seen an LPGA Tour Tan? Bronze legs up to the shorts line, then fish-belly white above that. Those legs are going to be leather in twenty years, and there are some older women on the tour who provide an example. If you must wear a ball cap, cover your face and neck with sunscreen, one that blocks both UVA and UVB rays. Apply before you get into the sun, and once again at the turn. Don’t neglect your legs and arms, either. And don’t think because it’s not a sunny day that you don’t have to worry. If you can see kind of a brightish place in the sky, then the burning rays are penetrating. Play well, have fun, and look out for yourself.